We live in Malmö which is a harbour town with a beach and lots of walks along the sea. There are both marinas and big industrial harbours. And yet the sea doesn't play a big role in our lives. I'm not a beach person. Having battled with body image issues all my life I've never felt comfortable in a bathing suit and I don't like getting sand everywhere and there are just too many flies/birds/people to make it worth it. But as summer is waning so are also the crowds on the beach and I can somewhat enjoy it if it's on my terms. So one night this week I got out of the office early and went home to pack up the cooler with some sausages, ketchup, mustard and bread and made a thermos of coffee. 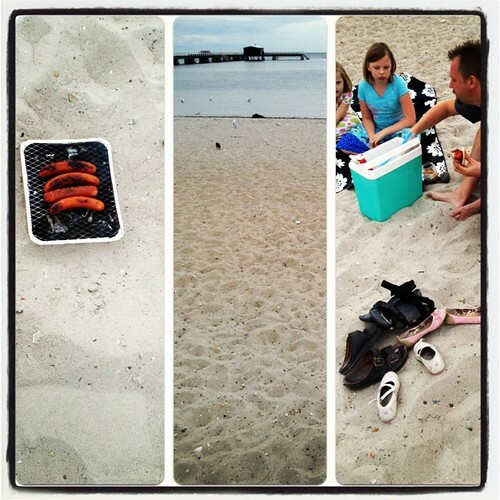 Once Rickard came home with the girls we hopped in the car and drove to the beach to have dinner there. It was lovely. A bit overcast and with a crisp bite in the wind (we really should have brought our cardigans) but no people. We lit up one of our many "engångsgrill" (single use grill - it's a big thing here) and grilled some sausages. We were out of hot dog buns but I found a pack of tortillas in the freezer that I brought along which turned out to be a stroke of genius. Easy for the girls to hold even with mustard and ketchup - and with some cronions (fried/roasted onions) in there it didn't matter if some sand got in there. It was already crunchy. I hope this isn't a one-time thing. I have an idea to make sandwiches to bring along next time. Or a salad. It was so peaceful to be down there in the evening. As always I question why we never do it more often.